The UK in July is bearing up against the midsummer. 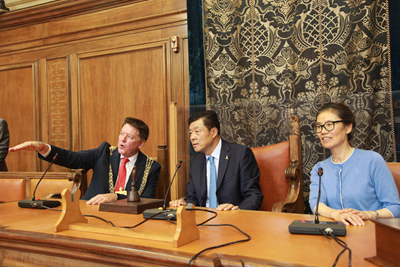 On 27 July, at the invitation of Leeds City Council and the University of Leeds, Chinese Ambassador Liu Xiaoming and Madame Hu Pinghua visited Leeds, a northern England hub, to meet with people from government, business and education community, and to attend the opening ceremony of Leeds Intercultural Theater Festival and the premiere of A Midsummer Night's DREAMING Under the Southern Bough by students from both China and the UK. Located in West Yorkshire in northern England, Leeds is about 190 miles from London. It used to be a wool and textile centre and an important industrial city in the country. Through structural adjustment and economic transformation, it has now become the UK's largest financial centre outside of London, a base for the digital and creative industries, the largest commercial and legal service centre in northern England, as well as one of the fastest growing regions in attending foreign direct investment. Ambassador Liu and Madame Hu Pinghua first visited the City Council of Leeds and were warmly welcomed by Ms. Judith Blake, Leader of the Council. Ms. Blake made an introduction on cooperation between Leeds and China in economy, trade, finance, education and culture, and happily recalled her pleasant visit to China last September. She said that she was looking forward to further enhancing cooperation between the two sides. 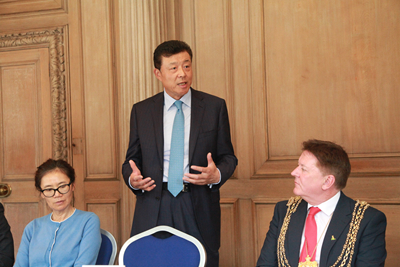 Ambassador Liu expressed his admiration for Leeds' urban restructuring and development and commended on the active efforts of Ms. Blake and Leeds City Council in promoting cooperation with China. He said that Leeds was no stranger to him though it was his first visit, noting Leeds' sister-city relationship with Hangzhou in 1989, the Ambassador hoped that Leeds would seize the golden opportunity of the current China-UK relations to further expand exchanges and cooperation with China. 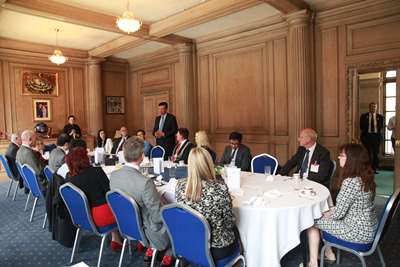 At noon time, Lord Mayor of Leeds Gerry Harper and Mrs. Harper hosted a welcome luncheon for Ambassador Liu and Madame Hu, in the company of representatives from government, business and education sector in Leeds. Lord Mayor Harper said that, Leeds had a rich history and culture, top universities and geographical advantages. 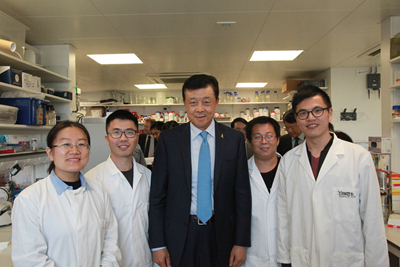 The city would be willing to continue to strengthen cooperation with China in various fields and stood ready to welcome more Chinese enterprises and students who come to Leeds for development and advanced studies. 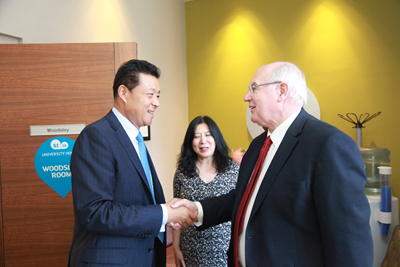 Ambassador Liu spoke highly of the friendly cooperation between China and Leeds. He mentioned in particular that Leeds provided training base for the Chinese team ahead of London Olympics in 2012, which was helpful to the Chinese team in achieving good results at the Olympic Games. He thanked Leeds for its important contribution. Calling his visit to Leeds a journey of friendship, cooperation and confidence, Ambassador Liu said that through contacts and exchanges with people from all walks of life in Leeds, he sought to further enhance mutual understanding, consolidate friendship and convey the determination of China in developing China-UK relations and the country's confidence in the prospects of China-UK cooperation. Leeds has an edge in finance, law, education, human resources and geography, and could strengthen cooperation with China in these areas and make greater contributions to China-UK relations. Ambassador Liu ended his speech with "Leeds lead" to express his best wishes for continued development of the city and its enhanced cooperation with China, winning rounds of applause from the guests present. Leaving the City Council, Ambassador Liu and Madame Hu went on to visit the University of Leeds. Founded in 1904, the University of Leeds ranks among the top ten in the UK and the world's top 100 in terms of scientific research, and boasts of six Nobel Prize winners. It now hosts over 2,000 Chinese students. On arrival, Ambassador Liu and Madame Hu were warmly received by the university management and over 50 representatives of Chinese students. 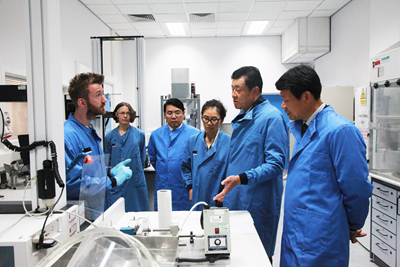 Accompanied by Deputy Vice-Chancellor John Fisher, Ambassador Liu and Madame Hu visited the Institute of Medical and Biological Engineering, the Centre for Plant Sciences, Inter Disciplinary Centre for Cellular Research, and learnt about research findings and cooperation with China in various fields. Ambassador Liu also talked with representatives of visiting Chinese scholars and Chinese students. He encouraged them to use their time well and work hard to become backbone of the society upon graduation and contribute to China-UK technological and educational cooperation. 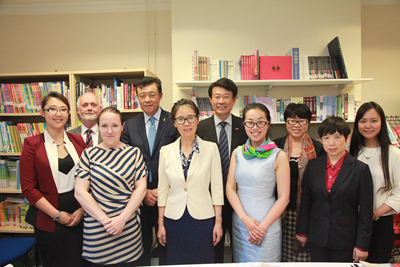 Ambassador Liu and Madame Hu then went to the Business Confucius Institute at the University of Leeds, run in partnership with the University of International Business and Economics. They listened to the introduction on the Confucius Institute and held cordial talks with teachers and students of the Institute. Ambassador Liu fully recognised the contributions made by the Business Confucius Institute to the promotion of Chinese culture and Chinese language teaching, and encouraged the teachers and students to give full play to their advantages and make persistent efforts in establishing the Institute as the bridge and platform to promote Chinese culture, advance China-UK friendship and expand China-UK cooperation. After the visit, Ambassador Liu and Madame Hu held discussions with Vice-Chancellor of the University of Leeds Sir Alan Langlands. Sir Alan Langlands said that the University attaches great importance to cooperation with China and has established cooperative relationship with more than 20 Chinese universities including Zhejiang University, Southwest Jiaotong University (SWJTU) and Wuhan University. In October 2015, SWJTU-Leeds Joint School was inaugurated, marking an important outcome of China-UK cooperation in jointly running schools. Sir Langlands commented that Chinese students not only brought diverse culture to the school but also became good-will envoys between China and the UK. Ambassador Liu spoke highly of the rigorous scholarship and innovative researches of the University of Leeds, and expressed his hope that the University would match its strength with that of Chinese higher education institutions, so as to enhance cooperation in teaching and research, strengthen academic and cultural exchanges, cultivate more international talents with a global perspective and professional expertise, and make greater contributions to development of China-UK cultural exchanges and development of the two countries. After the meeting, Sir Alan Langlands held a welcome dinner for Ambassador Liu and Madame Hu. More than 50 experts and scholars from various faculties attended the event. Leeds Intercultural Theater Festival was officially opened at nightfall. A Midsummer Night's DREAMING Under the Southern Bough, which was adapted by the University of International Business and Economics, Department of East Asian Studies and the Business Confucius Institute at the University of Leeds, was premiered in the UK. Accompanied by Sir Alan Langlands, Ambassador Liu and Madame Hu attended the opening ceremony and watched the premiere together with an audience of nearly 200 including teachers and students from Leeds and local residents. Before the performance, Ambassador Liu delivered a speech. He said this year marked the 400th anniversary of the passing of two drama masters - Tang Xianzu and William Shakespeare. During President Xi Jinping's state visit to the UK last year, he proposed that China and the UK could jointly commemorate the 400th anniversary of the passing of Tang and Shakespeare. This was an excellent opportunity to advance and deepen exchanges and mutual understanding between the peoples of our two countries. A Midsummer Night's DREAMING Under the Southern Bough was the fruit of collaborative work of artists and students from China and Britain. It was a creative interpretation of Shakespeare's and Tang's classic works. This ingenious re-production would transcend time and culture, and bringstwo literary masters to the same stage. Ambassador Liu pointed out that youth represents the future of China and Britain as well as the future of China-UK relations. He encouraged more and more young Chinese and British to come together to commemorate William Shakespeare and Tang Xianzu, to engage in closer communication and cooperation, to gain better understanding of each other's culture and build a deeper friendship, and to cement the foundation of the "Golden Era" of China-UK relations and create a brighter future for the two countries. 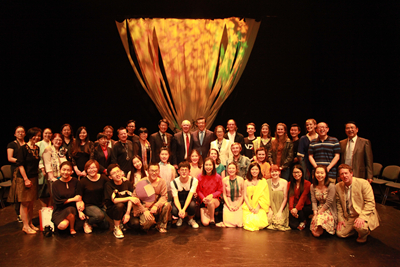 After the performance, Ambassador Liu, Madame Hu and Sir Alan Langlands greeted the cast, extended congratulations on the success of the performance and took group photos. It was hard to say goodbye in the midsummer night. 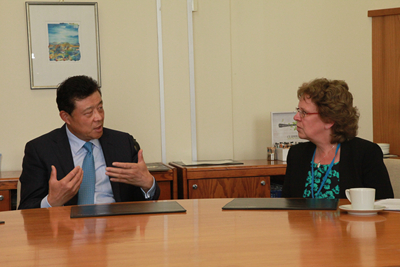 Ambassador Liu and Madame Hu left Leeds, and concluded the busy but fulfilling visit. Looking up at the moon, we could always recall the cheers and laughter; lowering the head and walking on, we bore in mind China-UK friendship.